October 1929, the stock market crash begins the era of the Great Depression (1929 - 1939); long lines of men seeking employment; families hoping for one full meal; the future of the entire United States is bleak. In 1933, President Franklin D. Roosevelt proposed to Congress what he called, "The New Deal". In his speech to Congress, he stated, "I propose to create the Civilian Conservation Corp to be used in complex work, not interfering with abnormal employment, and confining itself to forestry, the prevention of soil erosion, flood control and similar projects. I call your attention to the fact that this type of work is of definite, practical value, not only through the prevention of great present financial loss, but also as a means of creating future national wealth.". On March 31, the proposal was passed; Roosevelt issued Executive Order 6101 on April 5, 1933 and the Civilian Conservation Corp was born. During the years of 1933 to 1942, Utah had 116 total camps with an estimated 23200 men (200 per camp) ranging from the ages of 17 to 28. 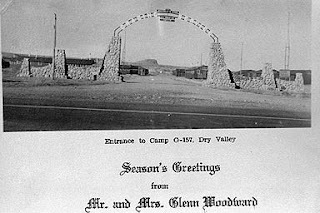 Many of the men were transplants from the East Coast; many stayed on to marry and raise families in Utah after the CCC camps closed down. In 1943, the camps closed down due to the intensity of World War 2; the men were needed for battle now. 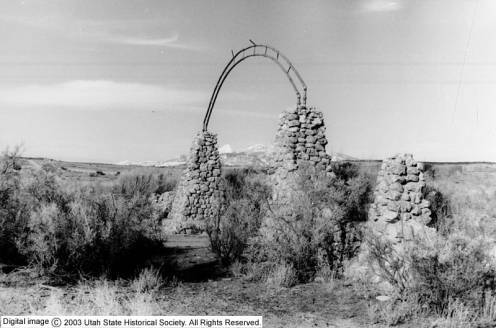 Two locations were turned into Japanese Internment camps; Topaz (Delta, UT) which is now a museum and Dalton Wells (Moab, UT) which is now decayed ruins indicated with a simple plaque along Highway 191. The Monticello camp (DG-157) was located in Dry Valley off Old Highway 191 which has been renamed San Juan County Road 179 aka Wilson Arch Road. It can be accessed 23.6 miles north of Monticello, across from Steen Road; or across from Wilson Arch through a new housing development. Throughout Dry Valley, Indian Creek, Blanding, Monticello and the La Sals; these hard working men constructed roads, fences, corrals; established flood control projects; reseeding, revegetation and cultivation; put up telephone lines, developed campgrounds; the road through the Abajo Mountains from Monticello to Blanding was even constructed by these crews. Morals and the American work ethic were ingrained into boys becoming men; men becoming self sustaining workers and leaders. 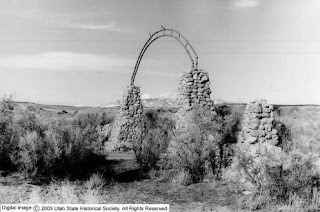 The CCC Camp men even influenced life in San Juan County towns, for example, take the story of Grant Arthur Anderson aka Uncle Cy ( https://familysearch.org/photos/stories/1049079 ) as written by Loraine Anderson Winger. "When a CCC Camp came to Monticello in the thirties the town kids could be found hitching a ride in the back of their truck from the bottom of the hill to the top again. The CCCs brought another advantage to this small town in the form of a movie picture for free each weekend. There had been Moving Pictures before in the old Young Theater , but they were silent movies with the dialogue printed on the screen and accompanied by a player piano. These were talking pictures. The whole community would attend including many parents trying to keep an eye on their young people. There would be a truck come to town before the shows and anyone willing to ride in a dump truck was welcome. A return truck would leave within a half hour of the end. If it was missed, there was a long walk back into town." Why am I calling this post, "Monticello's Decaying Past"? Essentially, hardly anything remains of the CCC Camp; barely anyone knows of, or remembers, its existence which is kind of sad. It's not just Monticello's past, it's part of our American past; how we, as a nation, overcame the hardships of the Great Depression; and helped our Allies win a devastating World War (2). The Entrance Gate in 1993. As I stated before, the road is located 23.6 miles north of Monticello; across from Steen Road. 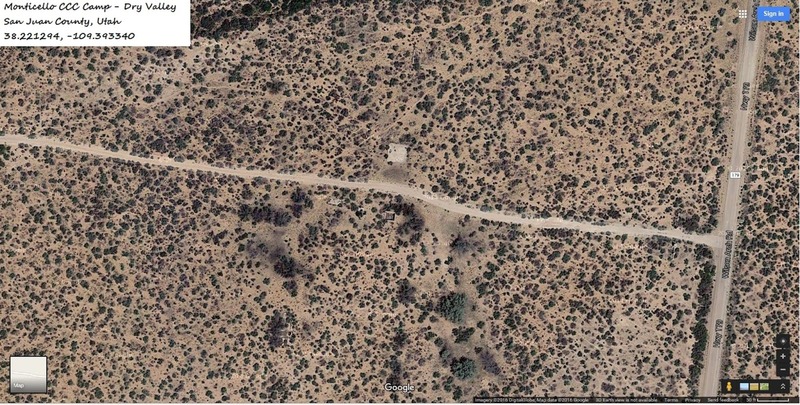 1.7 miles on the graded dirt road, on the left, the entrance pillars can just be seen. 1/10th of a mile down the CCC Camp road are the remains of buildings on both sides of the dirt road. By the way, this post will have over 50 photos in it, so you can get a good look see at what it looks like now. Also on the right side, we found this treasure, a relic of a, possibly, 1937 Pontiac. I spent a lot of time going through images online, and this year and maker seemed to be the closest. At 7/10ths of a mile, we ended our journey at an abandoned corral and watershed; a trail led off to the left over a rock formation, but we weren't in the mood for rock crawling the day we visited the CCC Camp. Once back onto SJC 179, we headed north towards Wilson's Arch; once again, a part of history had been erased. At one time, painted onto the old pavement was "HWY 191", but the pavement was now ripped up and graded in various spots; only a memory of seeing it remains. At 4 miles (that's from the junction of 191 and 179) we came to an overpass which is in dubious condition, and overlooks Joe Wilson Canyon. However, we saw new building material nearby; the signs for oil and gas wells probably means the overpass must be repaired to take the weight of tankers coming in and out of the area. At five miles is Highway 191 again, Wilson Arch, and the Wilson Arch Community which is a housing development. So, if you begin the journey to the CCC Camp from this end, it will be located at 3.3 miles on the right hand side. There it is, another piece of Monticello, Utah's history which is being taken, by nature, into the ground. Kind of poetic if you think about it; the men at this camp reseeded and cultivated vegetation in Dry Valley; now the camp will always be a part of Dry Valley.